Rhinovirus (RV)1B replication is increased in primary cystic fibrosis (CF) bronchial epithelial cells compared with control cells. a) Live RV1B in supernatants was measured by the 50% tissue culture infective dose (TCID50) assay and b) intracellular viral RNA was assessed in cell lysates by real-time quantitative PCR at 24 h post-infection in primary control and CF bronchial epithelial cells. Data are presented as median of 11–14 independent experiments. Statistical analysis was performed with the nonparametric Mann–Whitney U-test. Azithromycin (AZM) treatment decreases rhinovirus (RV)1B replication in primary cystic fibrosis (CF) and control bronchial epithelial cells. Intracellular viral RNA was measured at 24 h post-infection by real-time quantitative PCR in primary a) CF and b) control bronchial epithelial cells with or without pre-treatment with AZM (50 μM) for 24 h. Data are presented as median of 11–14 independent experiments. Statistical analysis was performed with the paired nonparametric Wilcoxon rank test. Azithromycin (AZM) does not induce cell cytotoxicity in primary cystic fibrosis (CF) bronchial epithelial cells. 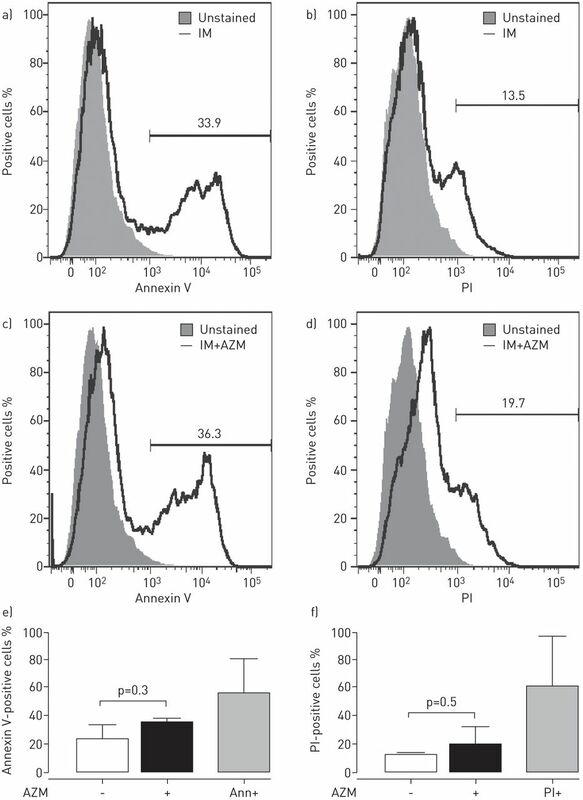 a–d) Histograms of annexin V- (a and c) and propidium iodide (PI)-positive (b and d) primary CF bronchial epithelial cells at 24 h after treatment with or without AZM (50 μM). Data are representative of three independent experiments. Percentage of e) annexin V-positive and f) PI-positive primary CF bronchial epithelial cells was assessed at 24 h after AZM treatment and in untreated cells. Data are presented as median (range) of three independent experiments. Statistical analysis was performed with the paired nonparametric Wilcoxon rank test. IM: infection medium; Ann+: annexin V positive control (1 μg·mL−1 polyinosinic:polycytidylic acid); PI+: PI positive control (frozen cells). Azithromycin (AZM) stimulates the expression of rhinovirus (RV)1B surface receptor and pattern recognition receptors in primary cystic fibrosis (CF) bronchial epithelial cells. mRNA levels of a) low density lipoprotein receptor (LDLR), b) Toll-like receptor (TLR)3, c) TLR2, d) retinoic acid-inducible gene (RIG)-I and e) melanoma differentiation-associated protein (MDA)5 were measured at 24 h after RV1B infection by real-time quantitative PCR in primary CF bronchial epithelial cells treated or not treated with AZM (50 μM). Expression levels were normalised to those of 18S ribosomal RNA (18S). Data are presented as median of 11 independent experiments. Statistical analysis was performed with the paired nonparametric Wilcoxon rank test. pIC: polyinosinic:polycytidylic acid (1 μg·mL−1). Azithromycin (AZM) upregulates interferons (IFNs) and IFN-stimulated genes (ISGs) in primary cystic fibrosis (CF) bronchial epithelial cells. mRNA levels of a) IFN-λ2/3 and b) IFN-β, and c) protein levels of IFN-β were measured 24 h after rhinovirus (RV)1B infection by real-time quantitative PCR (qPCR) or ELISA in primary CF bronchial epithelial cells treated or not treated with AZM (50 μM). mRNA levels of the ISGs d) viperin (virus inhibitory protein, endoplasmic reticulum-associated, IFN inducible), e) MxA and f) 2′,5′-oligoadenylate synthase (OAS) were measured 24 h after RV1B infection by real-time qPCR in primary CF bronchial epithelial cells treated or not treated with AZM (50 μM). Expression levels were normalised to those of 18S ribosomal RNA (18S). Data are presented as median of 11 independent experiments. Statistical analysis was performed with the paired non-parametric Wilcoxon rank test. pIC: polyinosinic:polycytidylic acid (1 μg·mL−1). Azithromycin (AZM) does not prevent rhinovirus (RV)1B-induced pro-inflammatory cytokine production in primary cystic fibrosis (CF) bronchial epithelial cells. a–c) mRNA levels in cell lysates and d–f) protein levels in supernatants of the pro-inflammatory cytokines interleukin (IL)-8 (a and d), IL-6 (b and e) and the 10-kDa interferon-γ-induced protein (IP-10) (c and f) were measured before and 24 h after RV1B infection by real-time quantitative PCR or ELISA respectively in primary CF bronchial epithelial cells treated or not treated with azithromycin (50 μM). Expression levels were normalised to those of 18S ribosomal RNA (18S). Data are presented as median of 11 independent experiments. Statistical analysis was done with the paired non-parametric Wilcoxon rank test. pIC: polyinosinic:polycytidylic acid (1 μg·mL−1). 6 M 12 No No 6 M 2.6 No Inhaled ND Yes F508del/F508del No No Penicillium spp. CF: cystic fibrosis; FEV1: forced expiratory volume in 1 s; AZM: azithromycin; F: female; M: male; ND: not determined; S. aureus: Staphylococcus aureus; S. pneumoniae: Streptococcus pneumoniae; H. influenzae: Haemophilus influenzae; A. fumigatus: Aspergillus fumigatus; M. catarrhalis: Moraxella catarrhalis. #: history of hay fever, eczema or asthma; ¶: any treatment with systemic, inhaled or nasal steroids within the previous 3 months; +: at least one Pseudomonas aeruginosa-positive oropharyngeal culture during the previous 12 months; §: defined as by Kieninger et al. ; ƒ: present in bronchoalveolar lavage fluid at time of brushing. rRNA: ribosomal RNA; RV: rhinovirus; IFN: interferon; LDLR: low-density lipoprotein receptor; TLR: Toll-like receptor; RIG: retinoic acid-inducible gene; MDA: melanoma differentiation-associated protein; viperin: virus inhibitory protein, endoplasmic reticulum-associated, IFN inducible; OAS: 2′,5′-oligoadenylate synthase; IL: interleukin; IP-10: 10-kDa IFN-γ-induced protein; FAM: 6-carboxyfluorescein; TAMRA: tetramethylrhodamine.